Les Miles seems to be the early leader for this job. It's hard to know Les Miles' intention with any opening. For him to keep getting his buyout from LSU he has to be actively seeking another coaching position. Does he really have interest in the Kansas job, or does he want to simply show LSU that he has an interest? That said....Kansas is a dead-end job in football. The big fat dude, whatever his name is, did a really good job when he was there. Mark Mangino. And Kansas fired him because he wasn't pretty enough. Mangino served as the head football coach at the University of Kansas from 2002 to 2009. In 2007, Mangino received several national coach of the year honors after leading the Jayhawks to their first 12-win season in school history and an Orange Bowl victory. However, he resigned as coach at Kansas two seasons later following allegations of mistreatment of players. While at Kansas, Mangino coached in four bowl games with a 3–1 record. Additionally, in five of his eight seasons at Kansas, the Jayhawks were Bowl eligible, they were only bowl eligible five times in the previous thirty seasons. From Wikipedia: While at Kansas, Mangino led the Jayhawks to 19 consecutive weeks ranked in the AP and/or USA Today polls (2007–08), 20 wins in a 2-year period for the first time in school history, set home attendance average records in each of the last 4 seasons (2004–2008), led KU to its first appearance in national polls since 1996 and to the school’s highest ranking ever at #2, produced the top 3 total offense seasons in school history, the top two passing seasons and two of the top three scoring seasons and won three Bowl games—the same number they had won in their 102-year history combined prior to his arrival. 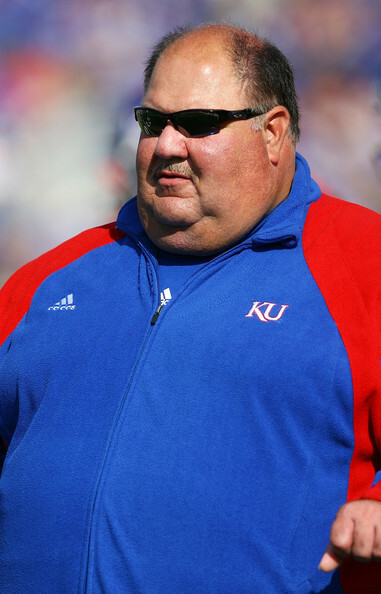 Mangino finished his 8 year tenure at Kansas with a 50-48 record. Considering how awful Kansas ALWAYS is, I would say that was a hell of an accomplishment. I’m not sure how many of those New Orleans kids ever made it to campus. It was my understanding most of them had academic issues. Kansas has, or had....I dunno, but will check...a former New Orleans high school coach as an assistant and chief recruiter. He had signed some VERY talented kids out of New Orleans to go to Kansas. His first crop would have been freshmen this year, and maybe they were all redshirted. If so then the next coach will have some good football players to build around going forward. Now, maybe those same kids will transfer out....can't blame 'em for wanting to get out of Kansas. Yeah, it's Tony Hull...his title is Associate Head Coach. He coached at Warren Easton HS in New Orleans and developed a pipeline of recruiting kids up to Kansas. He signed some real blue-chippers. But! as we all know, nowadays, kids are very likely transfer to other schools. I don't know the status of any of the players he signed out of New Orleans. Pooka Williams is tearing it up as a true freshman this season. He will likely be a freshman All-American, averaging like 6 yards per carry. I saw him play at Hahnville a couple of times. He freaking put Hahnville on his back and carried them to the Dome last season. One of the greatest individual performances in Louisiana high school history. You could be right, but I think he does want to coach again. We will see as time plays out. Pooka Williams has done really well. Miles does not add wins to a program. If the school has the resources that should result in a 10-3 or 11-2 record year in year out, Miles will deliver 8-5. Winning 10 or more games a year is very difficult, even for schools with the best resources. Over the last five full seasons I think only eight teams averaged ten wins per year: Alabama, Clemson, Florida State, Ohio State, Wisconsin, Oklahoma, Stanford and Boise State. It is possible I didn't think of a couple, but I am sure I didn't miss many. You have any idea how many Miles averaged in his 11 full seasons in Baton Rouge? 10.2 wins per season. He fell victim to his early success at LSU and the success that Nick Saban is enjoying at Alabama. Of course only Alabama, Kentucky, Auburn and Vanderbilt have head coaches with more than two years on the job at SEC schools, so lots of others have fallen victim to the "Saban Effect". Mississippi State would be included in that list but Mullen left for Florida. I don’t care. I just repeated what I heard Charles Hanigriff say on the lsu and you show with Billy Ryckman. For Dallas ... North Texas coach Seth Littrell has been mentioned as a potential KU candidate, though there have been mixed media reports on whether he would be interested. Could SMU coach Sonny Dykes be involved? Or could it have been a meeting with a potential coach’s agent? Ole Sonny D !!! I actually didn't think of Littrell. Who knows, right? It is kind of interesting that folks track private jets flight plans rying to figure it all out. Not sure if Sonny will luck into another P5 job so quickly, even if it is Kansas, but one never knows. I hope Sonny D does go to KU. If he stays at SMU he will turn that program around...to a point. Enough to generate excitement and become a serious rival for talent we might be recruiting. Dykes needs jucos to be successful. I don't think he will be able to do that at SMU. I don't think he will ever be successful there. He should have held out for a Big12 to come open. SMU has about as much potential to have an energized fan base as Tulane or Tulsa. Well this may be his Big 12 opportunity. Dykes has SMU at 5-5 now. Have Memphis and Tulsa left, should beat Tulsa, so back to the Frisco Bowl at 6-6, maybe 7-5.